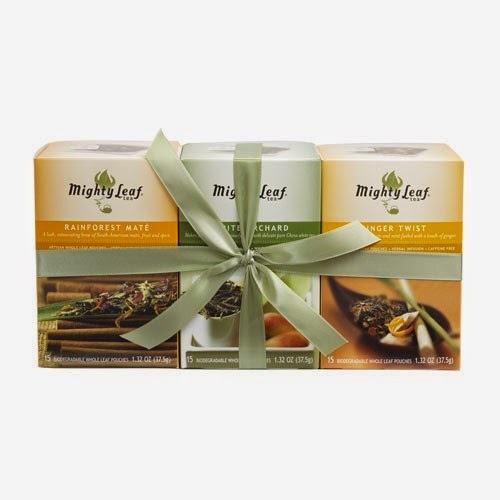 Join us for TWO Chances to Win with Mighty Leaf Tea! After sipping only the hottest teas all winter long, I'm starting to enjoy my hot brewed tea -- over ice! One of my favorite brands to do so with is Mighty Leaf. I always have a few boxes of their tea on hand for indulging in rich and exotic flavor profiles that I can't come by in my own herb garden. They brew perfectly and guests love it, too! I sampled some of their teas in the Mighty Leaf World Flavors Sampler. While I didn't like all of them the same, I was hooked on the White Orchard variety (which was blissfully aromatic and full of melon and peach in a very light, white tea.) If you like Ginger (which I'm not particularly a fan of), you'll like the ginger Twist; it's great for tummy issues and also has a hint of licorice and ginseng! If you're going for a great detox tea, I can't say enough about the Organic Detox Infusion. It's minty, so it's one of the better-tasting detox teas out there! Each box has 15 pouches; the set will last you for weeks! *Tea samples received to review. Opinions are my own.